Moving my posts from here on out to my new blog page. Another week in the books & this winter training is as hard as I thought it would be. Some days it's just so hard to get outside in the cold weather. I've done most if not all my harder workouts, but it's the easy runs that I usually skip. That being said, I always get out & walk my dog & ref my basketball games which help stretch my legs. Monday was my gym day, but I was still tired from Sundays long run. Still made it the evening lap swim & did 1500 yards continuous. Tuesday was to be mile repeats but I just couldn't get out the door & I had a basketball game out of town. Wednesday is our group run. Since only 1 person ran 3 miles with me, I decided that was my warm up, then I did my 3 x 1 mile repeats with 1/2 mile easy between & cool down for a total of 7.7 miles. them went straight to the pool for another 1500 yards. Thursday was a rest day then Friday was tempo day, 9 miles with 6 miles at MP. Good run, felt great even if it was only 20 degrees outside. Saturday I had a basketball game at noon with another one at 6pm, good enough for the day. Sunday I got in my long run, 18.25 miles under 9:00 pace. That 'magic' 9:00 pace is what I have been shooting for on my long runs, so anytime I can stay under that, it is good. Basketball season is starting to wind down, so hopefully I can stay with my plan better. Weekly training totals - 35.3 miles, 5:06:24, 8:40 pace. Marathon training totals - 276.34 miles, 41:38:08, 9:02 pace. Since I did my Sunday long run on Monday, that makes this week a short week. So Tuesday was my rest/gym day. Did my jump rope, strength training, & ab/core routine. I then went to the IU basketball game, which didn't start until 9pm. That makes for a long night, but also makes for a tired Wednesday. Was suppose to do a hills run on Wednesday but I felt exhausted. So it turned into rest day, minus working 2 basketball games. Thursday I did a easy 5 mile run, plus 2 more basketball games. Friday was a tempo run. I have turned myself into a good tempo runner, at least in my mind. I did 7 miles with 3 at MP. One problem with that, I misread my training plan. I was suppose to do 4 miles at MP. Oh we'll, can't go back. Saturday was a day to do chores around the house. 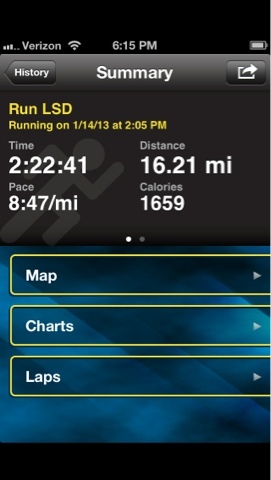 Sunday was my LSD day which I did 14 miles at 9:00 pace. The weather man on the news said it was cold outside & I listened & over dressed! Another week in the books & I think I'm still right on schedule for my PR in March. Weekly training totals - 26.21 miles, 3:48:55, 8:44 pace. Marathon training totals - 241.04 miles, 36:31:44, 9:05 pace. This week of training started cold, then it got hot (for January), then back to cold. But that's how it goes here in southern Indiana. Monday was my rest/gym day, did jump rope as a warm up. Squats, bench press, dead lifts, arm curls, & chest rows as my strength training. Then an ab/core routine to finish off the workout. Tuesday was hill day. I set out on a new route that I usually bike but have never ran before. The route was in the country but still some traffic which makes running up & down hills a little tricky. Wednesday was the Seymour Run Group which we do a 3 mile loop, with about half of us doing a second loop. This is my easy run as I just run with whoever & visit. Always a good time! Wednesday was also the first evening lap swim of the new year. I was a little tired from running since our group finished at 7:15pm & swimming started at 8pm. Maybe didn't help also that I had not swam since the end of August! Got in 1200 USA (500, 500, & 200). Thursday was another rest/gym day & I took advantage of the rest since I was exhausted from the run & swim the night before. Friday was a tempo day, 7 miles with 3 miles at marathon pace (MP). Actually did the 3 miles at a little faster than MP. Saturday was an easy run day, but I was scheduled to work/ref 4 games out of town. That took up 9 hours of my day & my legs & feet were hurting from those games, so I just took it easy the rest of the day. Sunday was my scheduled long run. When I got up, I was hungry for breakfast, so breakfast it was. Plan then was to run in the afternoon. I didn't realize it was suppose to drop in temp by 20 degrees & RAIN. So on to plan B, watch football & rest, then do my long run on Monday. I was able to get it done on Monday, 16 miles at 8:48 pace. That is the fastest I've ever ran 16 miles. Right on plan for my marathon. Weekly totals - 36.7 miles , 5:23:36, 8:48 pace. Marathon training totals - 214.83, 32:42:49, 9:08 pace. First week of 2013 is my 5th week of my 16 week marathon training for DC race on March 16th. Started the year with a New Year's Day group run. Didn't really want to go but since I was the one that organized it, I thought it was best that I went. Stayed out too late (or early) at a friend's house playing cards & ringing in the new year. Anyways, 4 of us showed up for the run. We got in 5.6 miles for the day. Wednesday was our usual run group, 6.2 miles. Thursday is a rest day & that is exactly what I did. Well, I did ref a basketball game but I don't count that as exercise. Fridays are tempo day, got another 6.3 miles. These would have been a PR except it wasn't a race. This gets me excited for a 10K race in February! Saturdays are an easy, short run day but... I decided I needed another rest day. I'm trying to limit the missed runs this year. Sunday are LSD days (long, slow, distance). This Sunday totaled 14.1 miles. At 8:59 pace. I'm trying to keep my LAD runs around 9:00 pace. My goal pace for the marathon is between 8:00-8:30, haven't decided exactly yet. I think I can do 8:00 which makes the marathon about 3:30 total but my PR is 4:18. That is a big difference. OK, I'm deciding right now that I am shooting for a 3:30 marathon! Weekly total - 32.3 miles, 4:47:45, 8:54 pace. Marathon training totals - 178.12, 27:19:13, 9:12 pace. We are now 2 days into 2013 & I've got 2 run workouts in. Sounds like I've started a run streak but that will end tomorrow. I'm signed up for the Rock 'N Roll marathon at DC on March 16th & I'm following a training plan. Thursday's are rest days so I usually go to the gym to do strength work. I registered for this event to keep me motivated over the winter & so far it is working. I also started a Wednesday night run group. When you know someone is there waiting on you, it gets you out the door. Now back to the new year. I don't do resolutions. I believe if something is worth doing, you should start doing it right away. Don't wait till tomorrow or next week or next year. I do however believe in goals & the beginning of a new year is when us as runners, bikers, swimmers, & triathletes set our goals for the year. And when you put it in writing, you are more accountable for those goals & now the people who read this help hold me accountable also. So here goes. #1 Sub 6 minute mile - my fastest timed mile over the last 11 years is 6:44, but I did a 6:20 mile during a 5K. #2 18:59 5K - last year I wanted a 19:59 & got a 20:01, but if my mile time is sub 6 then I figured what the heck, let's make it good! #3 3:45 marathon - now this one will be the hard one because I only have 1 or 2 chances. Since I have a marathon in March, the weather always plays a factor that time of year. #4 5:30 Ironman 70.3 or Rev3 70.3 - as of right now I plan on doing one of each, Muncie IM 70.3 in July & either Cedar Point Rev3 70.3 or Branson Rev3 70.3, both are in September. #5 Qualify for USAT Age Group Nationals (again) - I qualified in 2012 but by the time I did in July, the race was in August & was already sold out. Best case is to qualify at the Columbus Olympic Triathlon in August for the Nationals in 2014. #6 Last but not least is register for Ironman Wisconsin 2014 - registration fills up fast & the best way is to go to the 2013 event & volunteer, then register on-site the next day. Bad thing is that is the same weekend as Cedar Point Rev3, which my family wants me to do. As some of you know, my family is very supportive of my racing & go t most of my races. One other thing I want to do but is not a goal is that I want to post to this blog once a week with my training. Here's to a new year of training & racing. Have a good one & see everyone at the races! Liz talked me into riding one last time. We all met (Matt, Seth, Liz & I) out at the Wildlife Refuge with our off-road bikes & just road gravel/dirt roads. 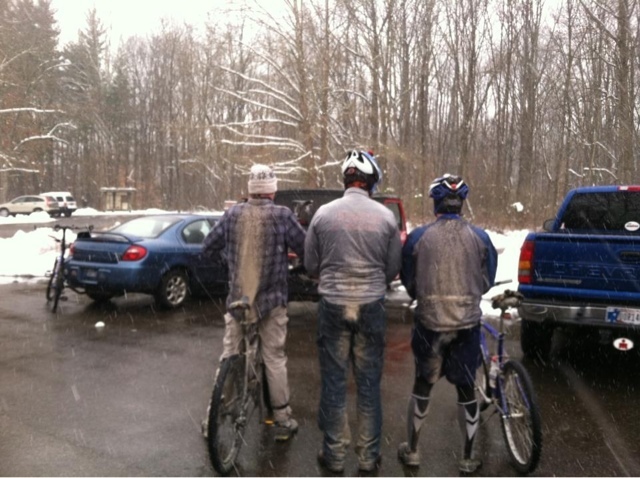 They were muddy, snow & ice covered, & just plain fun! 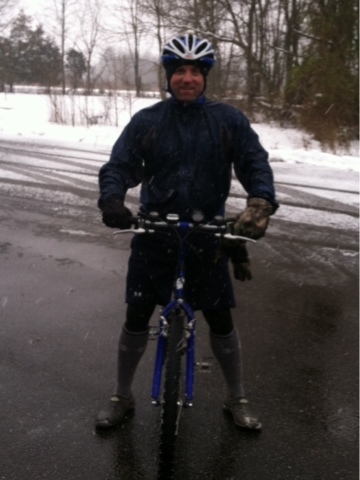 Did about 10 miles in 45 minutes with it snowing/icing/raining. Good way to end the year.